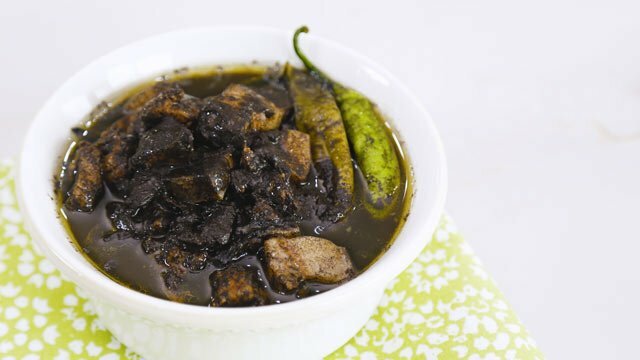 This Pinoy dish combines lechon kawali and dinuguan. Delicious! Instead of the usual pork innards, crispy lechon kawali is used to make this special version of dinuguan. Prepare the lechon kawali: Mix together garlic, peppercorns, bay leaves, salt, and water in a saucepan. Add pork, making sure that it is completely submerged in water. Simmer until pork skin is tender, about 30 to 40 minutes. Drain, cool, and dry well before frying. You may do this ahead of time; just freeze the pork at this point. Deep-fry pork belly pieces until golden brown and blisters show on the skin. Set aside. Blend coagulated pork blood with some salt. Mix together with vinegar, onions, garlic, and pepper in a saucepan. Mix well and bring to a boil. Lower heat to a simmer; add water, sugar, and patis. Add minced chicken liver and chilies to the mixture. Season to taste with more patis. Simmer for 5 more minutes, then add lechon kawali. Mix just enough to coat the pork. Serve immediately with rice or puto.